Drop potential is how likely you are to get a good and expensive drop in a PvP world. Drop potential, or DP, was released on 9 December 2008, after many players complained on the Official RuneScape Forums that the randomly generated drops in PvP worlds weren't good enough. 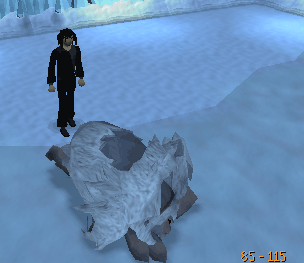 Drop Potential, along with PvP and Bounty worlds, were removed from RuneScape on 1 February 2011. If you kill a player, you will now receive all items held by them. This content serves only as a historical reference. You can gain drop potential by staying outside of a safe zone in a PvP area. The 'levels' of drop potential go up in intervals of thirty minutes. For example, Player A has been standing in a PvP world for two hours. He will get a better drop than Player B, who has only been standing in PvP for one hour. RuneScape's system of drop potential can only count full minutes. If you have been standing in a PvP world for 29 minutes and 59 seconds, you will not get the full 30 minutes drop potential. To gain drop potential, it is recommended to be risking 76,000 coins or over. You can view how much you're risking in the 'Items Kept on Death' screen. Due to the fact you keep three items, it is recommended you have at least 76,003 coins in your inventory, unless you have something else other than coins or you are skulled. If you are F2P, you only have to risk 26,000 coins or over. It is recommended not to do this in F2P if you have the chance to do this in a P2P world, as the best drops in F2P are corrupt dragon, and they're very rare. If you are a F2P person reading this, replace any instances of 76 with 26. Note: The 76,000 coins you are risking can either be in pure coins or items. Drop potential increases faster if you are in one of four hot zones (Varrock, Falador, Ardougne, Troll Stronghold/Trollheim and the Wilderness). You can tell when you are in a hot zone by the flaming skull and crossbones that appears in the bottom-right corner of your screen. Drop potential can be gained by just standing around in a PvP world or training a skill. It is recommended you train a skill, as it is less boring than standing around and you can gain extra money while doing it. The following tells you which skills you are able to train in PvP while gaining drop potential. Note: Generally, places with no actual bank, just a banker (for example the Rogue's Den and the Bounty Hunter lobby) are not safe zones. Combat is one of the most popular skills to train in PvP, if not the most popular. Most of the time, you will not have to bring 76k, as you will be wearing armour. If you do not cover the 76k mark, bring some extra cash. Make sure not to risk 76k or part of 76k in food, as it can run out. If your 76k is not including food, it's fine. You can also train Range this way. Prayer is slow and risky to train while getting potential. The fastest way of getting Prayer experience, Gilded Altars in a Player Owned House is gone while getting potential, as Jagex have stated you do not get potential while in you, or anyone else's POH. You are unable to use the Ectofuntus, as you need to bank, thus going into a safe zone. The only way to train Prayer while getting potential is to find a bone respawn (the Chaos Altar in level 13 Wilderness, just north of Fist of Guthix is best, as it is in a hot zone, the Wilderness) and pick it up and bury it. You can either train it as part as combat, or you can use non-combat spells, such as Alchemy, Superheat Ore or Teleports. Teleports are a good idea, as you can teleport around quickly without a player killer being able to attack you. If a player killer has fast reflexes, he can teleblock you, rendering you unable to teleport and in deep trouble. If you are on the Ancient Magicks spellbook, teleports are your only option. In the Lunar Magics spellbook, a wide array of spells are available to you, and all of them can be used in a PvP world. If you aren't worried about losing a lot if you die, then you could try using Ice Burst or Barrage at either the monkey skeletons in the Ape Atoll dungeon or Rock Lobsters in the Chaos Tunnels. The Chaos Tunnels are generally very empty, so you could try utilizing the Mummies in there too. Cooking can be trained in the Rogue's Den, as it is surprisingly not a safespot. As this place is so popular, you have a relatively large chance of getting killed. You can also fish your own cooking material, chop down a tree, light the logs and cook it, then dropped the cooked food, training four skills at once. Woodcutting can be trained by cutting down trees and then dropping the logs. It is advised to use out of the way trees. A good, albeit slightly risky place to cut down trees, is chopping down the single Magic Tree in the Western Ruins in the Wilderness, below the Forgotten Cemetery. However, the tree only respawns when the adjacent Cursed Magic Tree in the Spirit Realm is chopped down. Fletching can be trained exactly how it is in a regular world, but you can't use regular banks. You can, however, cut down trees and then fletch the logs. Fletching arrow shafts is a good idea, as they stack, so you won't need to bank. Fishing can be easily trained by fishing and dropping the fish, cooking them before dropping them or banking them. You can train Barbarian Fishing in this way, as it is a common procedure to fish, gut and drop the fish. 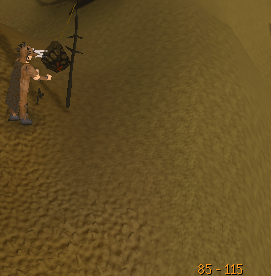 Fishing can also be trained in the Wilderness. You can fish lobsters in the spot shown on the map. Firemaking can be trained by chopping and burning the trees, or banking and burning in non-safe zone bank. Fist of Guthix is good for this, as the lobby is a long straight line. If you have finished Spirit of Summer, you can chop the Cursed Willow Roots in the Spirit Realm and burn them in the nearby firepits. Crafting isn't very popular to train, PvP or safe world. You can buy tanned dragonhide or leather, and craft them at an unsafe bank. You could also go to the Crafting Guild, kill Cows, collect Cow hides, tan them upstairs, craft them and drop them. Smithing is another unpopular skill to train in PvP worlds. The best way, if not the only way is to superheat the ores and withdraw more at an unsafe bank. Mining is simple enough. Mine and drop the ores. If you have 93 Summoning, you can use the Abyssal Titan's ability to bank all the Pure/Rune Essence that you hold. 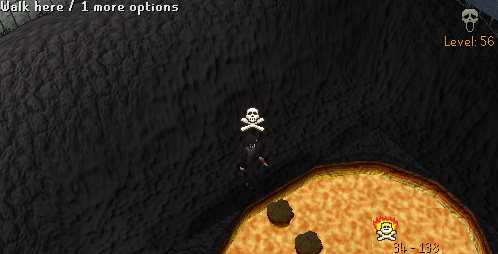 If you go to the rarely used Lunar Isle essence mine, then the chances of you being disturbed are minimal. You can also go to the Coal Trucks west of McGrubor's Wood. Herblore can be trained by obtaining all the ingredients by yourself, or training it at an unsafe bank. Agility is a good skill to train in PvP. 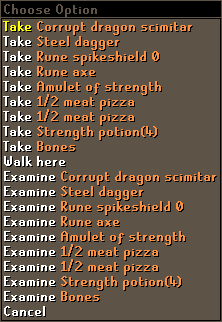 It is recommended you use the Wilderness agility course, as the Wilderness is a hot zone. 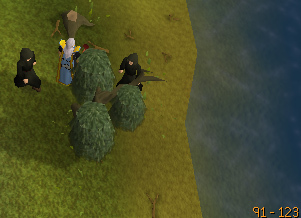 Player killers like to come to the Wilderness agility course and prey on the people training agility. If you encounter a PKer, either get him lost in the obstacles and hope that he fails on one of them, or go underground and keep on going up and down the ladder to confuse him. At the first chance you get, LOG OFF! Surprisingly, level range is affected by the Wilderness above ground, but not below ground. This can help if a person who is attacking you isn't normally in your level range. Train thieving as you normally would in a non-PvP world. Thieving can also be easily trained in Ardougne Castle, pickpocketing Paladins. If you need to escape from a PKer, check the nearby chest for traps and you will be teleported to somewhere near Witchaven. Slayer can be trained with PvP. If you get a Slayer task that you are able to kill in the Chaos Tunnels, kill them in the Chaos Tunnels. The Chaos Tunnels are almost always empty on PvP, and you can get the rare player killer lost in the maze-like portal system. Train farming as you normally would in a non-PvP world, just remember to bank at an unsafe bank. You can also use Pack Yaks and an Imp-in-a-Box to bank. 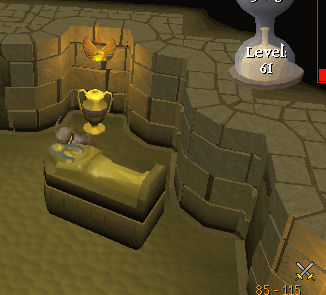 Runecrafting is hard to train, as the banks nearest to the altars are safe. 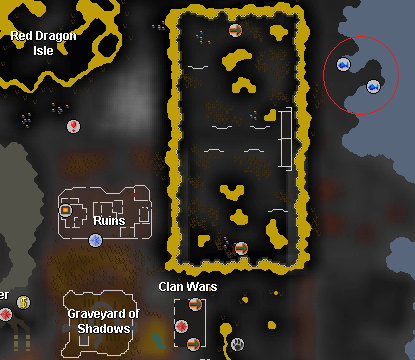 The best way would be to use a Ring of Duelling to teleport to either the Duel Arena lobby or the Castle Wars lobby and bank there, then use an Amulet of Glory to teleport to Edgeville and use the Abyss. Edgeville is populated with high level and experienced player killers, be wary of teleporting there. Train Hunter as you normally would in a non-PvP world. Construction is the only skill you are unable to train in a PvP world while getting drop potential, as drop potential doesn't increase in your POH. Train Summoning as you normally would in a non-PvP world. A combination of Spirit Kyatts and Rings of Dueling are a guide choice. Although not a skill, you can also gain potential while just standing around. You can either choose to find an incredibly secluded place, or hide in a hotspot. Good places in a hotspot to hide are upstairs or downstairs in secluded buildings in Varrock, Falador and Ardougne. If you have a good friend, you can attack each other unarmed, or wearing something with very low attack bonuses, such as bronze. This is popular in a hotspot , but remember not to do it in a multi-combat area, as other players will be able to attack you. If you are worried about getting hit or dying, then you can use Saradomin Brews to lower your combat stats to around 20, and increase your Life Points while you're at it. Now you have all this drop potential, it's time to know how to use it. You will need to find another player to kill. If you are a well-seasoned player killer, you can kill anyone for a better drop. If you are either a poor player killer or not a player killer at all, you can kill a friend. You need to be risking 76,000 coins at any one time when you are killing the player, and the person you are killing needs to be risking 26,000 coins (the amount of money the person you are killing needs is 26,000 coins on F2P and 76,000 on P2P). It is hard to tell how much a person is carrying if you are not killing your friend, so your drop potential will not be used up if the person you are killing does not have 26k. The method of killing a friend is known as the '76k trick'. Once you have killed either a person or a friend, it is recommended to run into a safe area and use the telegrab spell to retrieve the items. A popular place to kill people is the Grand Exchange, as drops can be easily retrieved with telegrab. You should find you get a much better kill than usual. It is only good manners to then switch around and let your friend kill you. A common way of killing/dying is 2-2-1-1. One person kills another person twice, then they switch around for two goes, then they switch around for one more go each. The above player has killed his friend using the 76k trick. His friend didn't have any items in his inventory except 26,000 coins. If he had not had any drop potential, he would've gained a very poor drop. Instead, he gained a Corrupt Dragon Scimitar, worth 2.2m. If you're worried about risking items, you can increase drop potential without risking anything. Go to a quest area or somewhere else where the game screen shows no other players than you. A good place to do this is the ice maze in the quest Myths of the White Lands. If you do get attacked, teleport as soon as possible. The best teleport is either a POH teleport or a Lumbridge teleport. A Ring of Life can prove invaluable. 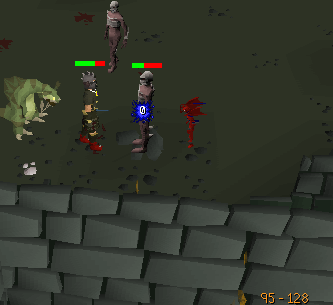 Remember, Revenants do NOT spawn on PvP worlds. Have an escape route ready planned incase you are teleblocked. If you don't, try to lose them up ladders/stairs or around buildings. PvP worlds on German servers are normally emptier, thus normally safer. Make sure you either know German or know RuneScape well enough to understand it in a different language. The French server also has a PvP world, but it's only F2P. If you are using Saradomin Brews and Bronze Weapons, make sure you and your partner re-attack each other ever once in a while. Jagex have released an update so people that aren't taking damage in PvP worlds can be attacked by other people. A Dragon Spear can save your life with it's stun special. You can also use a Zamorak Spear. If you are standing around in a hotzone, leave auto-retaliate and the special on. When somebody attacks you, the Shove special will stun them, leaving you able to escape. If more than one player appears to attack you, this will not be as effective. You can use the Bind spell in F2P, but it will not work very well. Like any other spell, Bind has a chance to not hit the opponent, or 'splash'. If this happens, the opponent will still be able to move and attack you. The higher your Magic Attack bonus is, the less frequently the spell will splash. The most practical armour that gives a Magic Attack bonus in F2P are Wizard Robes. Wizard Robes provide a very low defence against melee and range, leaving you susceptible to either of those attack styles, the most popular in F2P. It is recommended you don't wear Wizard Robes, but in doing so you sacrifice your ability to Bind successfully. The negatives outweigh the positives of wearing Wizard Robes though.